The scheme, being carried out by Toman Paving Ltd, involves excavating and clearing the route of the overgrown path that passes underneath the arch and which was once an integral part of the network of paths and carriageways in the park, in this case providing a link to the “Upper Park” and Schoose Farm. The re-established path will provide a much-improved surface with a more gentle gradient, enabling comfortable pedestrian access from Hall Bank to the entrance to the Park off Stainburn Road. 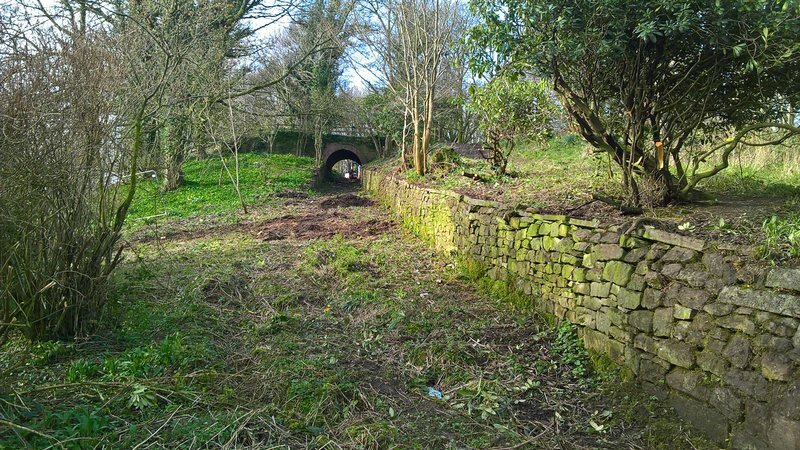 In addition to the path improvements, vegetation will be removed from the stone walls on either side of the path to expose the stonework and repairs to the wall will be undertaken where necessary. The work is being funded by Allerdale Borough Council with additional grants from Nuvia and the Tesco “Bags of Help” scheme. Although the council’s Stage One application to the Heritage Lottery Fund for an ambitious park-wide improvement scheme was unsuccessful, the council has been invited to re-apply, and this will be progressed in the coming months following dialogue with the National Lottery Heritage Fund. In the meantime opportunities to carry out small-scale improvements such as the one at Cuckoo Arch, will continue to be undertaken where the opportunity arises.